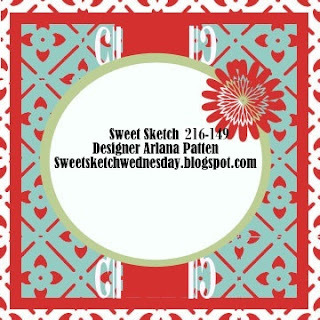 Wednesday again and that means it's time for a new Challenge over at Sweet Sketch Wednesday!! This week our Sketch is a blast from the past created by Arlana!! "My name is Jacqueline Mathews and I am a crafter and designer. I love paper, pens, doodling, stamping and above all designing. I have a degree in fine arts with an emphasis in graphic design. I worked in the graphic design industry for many years and quit 15 years ago to become a stay at home mom for my 3 kids. Now that the kids are older and don’t need me as much, I am reinventing myself and have decided that I wanted to create my own line of digital stamps. I have dabbled in rubber stamping and became a “Stampin’ up!” demonstrator and had a blast, but thought it would be more fun to create my own stamps. I decided digital was the way to go. It is affordable for the customer and for the designer. I now have a digital stamp shop on Etsy called “PaperAddictions”. I would love to create my own line of rubber stamps someday, but for now I am testing my designs out in my shop to see if anyone likes them. I am pleasantly surprised that I have gotten a good response to the images I have designed so far. This positive response has motivated me to create more images in the future." Jackie is offering 5 images from her shop!! Head on over and check it out by clicking HERE, so many wonderful reasons to join us this week!! 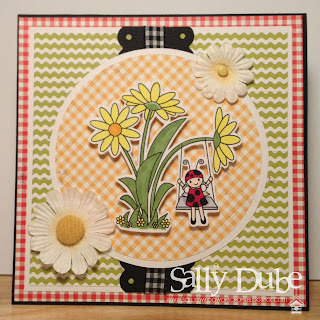 Here is my card using KatieBug On a Swing! Sweet card Sally. I love your papers - perfectly summery. what fun papers with your darling image. I love how you cute the image out and used the gingham background for the circle. Soooo cute!!! Have a great week. Super cute, love you paper picks and how you cute out the darling iamge. Have a great weekend. I love all the texture on this card; your paper is phenomenal and that image is darling. 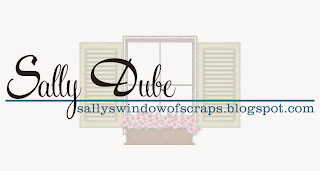 Hi Sally sorry I'm late commenting but I've been away with my family for a few days break before the boys go back to school this coming week. Love your sweet card this little image is so cute and such and awesome image for a little girls card. Love your white daisy embellishments just perfect for your card. Take care and hope you've having a great weekend. 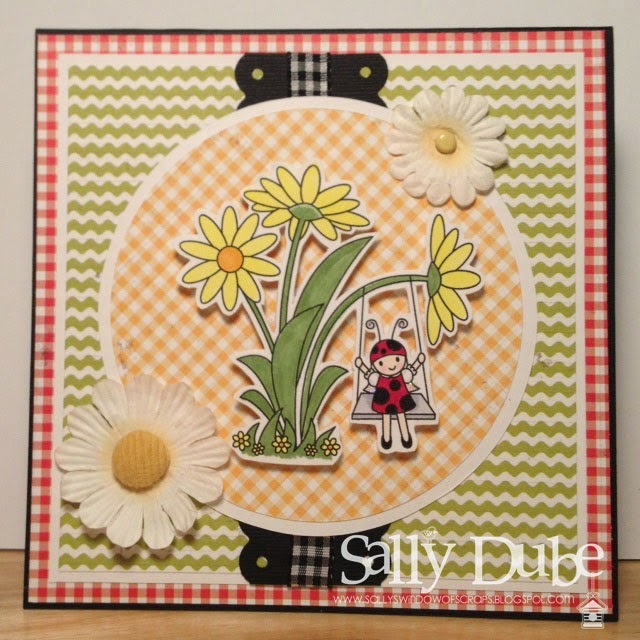 Such a cute little ladybug and the fun and fresh colors and papers you used are perfect!